Looking for an easy and healthy chicken breast recipe? Look no further. 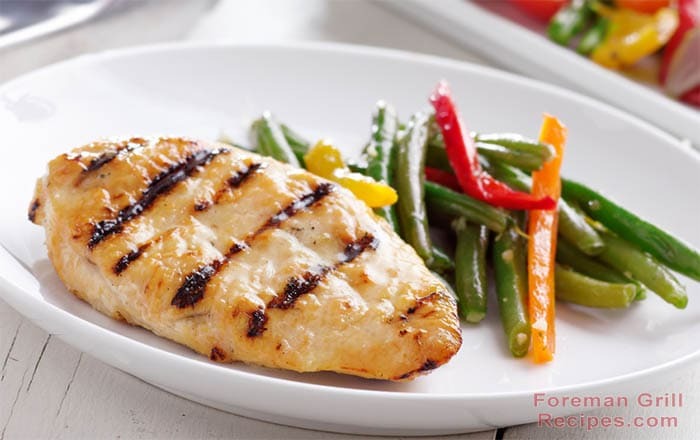 You can make an excellent boneless skinless chicken breasts right on your Foreman Grill. This recipe is very versatile and can be enjoyed as a meal or in a variety of chicken dishes. If you have fresh herbs, by all means use them! Dry prepackaged herbs will work excellent too are are inexpensive and go a long way. As with all chicken breast recipes on a George Foreman Grill, you’ll get best results using a cut of meat that isn’t too thick. Use a meat mallet and pound larger chicken breasts thin – to approximately 1/2″ thick. The results will be greatly rewarded. This will also help to make the chicken more tender. If you’re on a diet to lose weight, this is an excellent recipe to make a meal of. Add some fresh steamed vegetables for a wonderful low-fat, low calorie, low sodium meal. Mix all ingredients except chicken breasts well in a ziplock bag. Add chicken and make sure chicken is well coated. Let marinate in fridge for at least a 1/2 hour if possible. Preheat your George Foreman Grill for at least 5 minutes with the lid closed. Place chicken on preheated grill and close lid. Grill for approximately 5 minutes. Check for doneness. Make sure there is NO pink in the middle. Serve with steamed vegetables for a delicious and healthy meal. Can I cook chicken breasts with the skin on in the grill? My mom just gave me one, she hasn’t used in awhile. Of coarse instruction book is long gone. Could you tell me what temp setting for the grill? Cooking boneless breast.